1910s era postcard of the I.O.O.F. 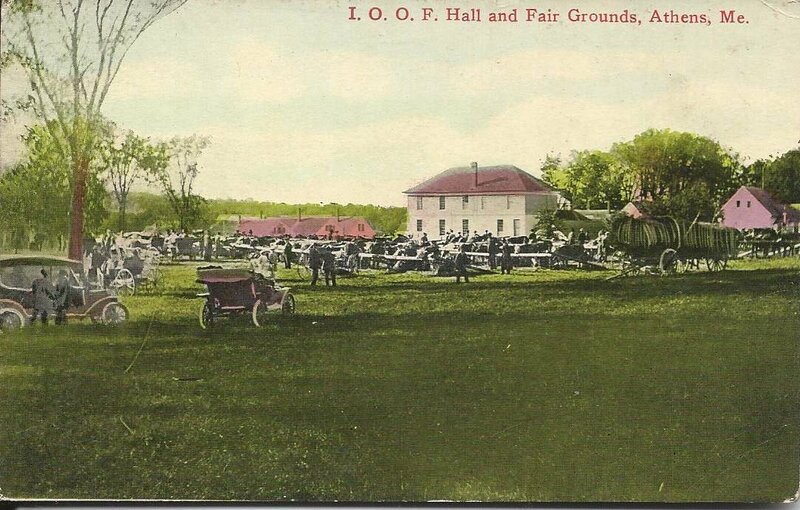 Hall and Fairgrounds at Athens, Maine. Two period automobiles are in the foreground. 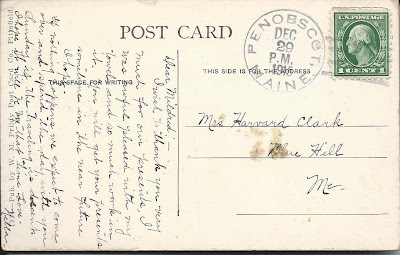 The postcard was postmarked Penobscot, Maine, mailed from Nella to Mrs. Harvard Clark at Blue Hill, Maine. I'd like to know how Nella came to acquire the card, as Athens is several counties away from Penobscot and Blue Hill, and the postcard is from an era when travel was more problematic. Perhaps Athens is a clue to Nella's identity. Mrs. Harvard Clark was the former Mildred Alice Bisset. Harvard had a sister named Della, but the name looks more like Nella to me. 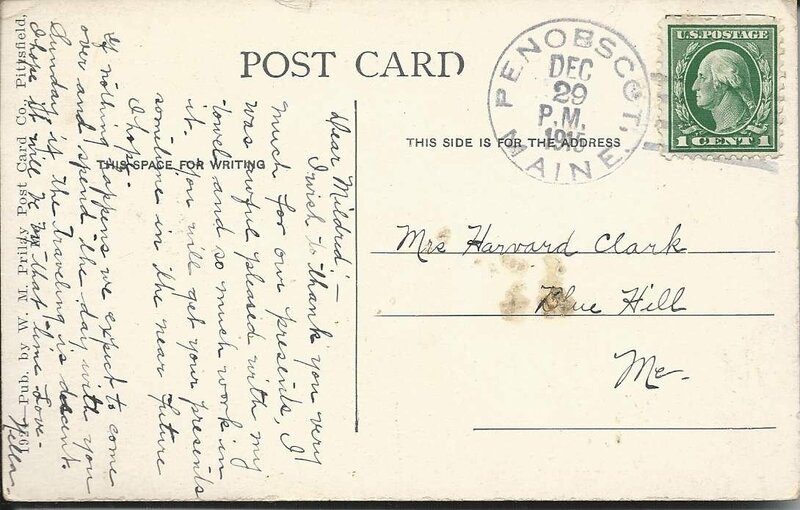 It's likely that Nella lived at or near Penobscot, Maine, where the postcard was postmarked, as travel would have been difficult in late December. Mildred Alice Bisset (sometimes seen as Bissett) was born 10 February 1894 at Penobscot, Maine, daughter of William P. Bisset, Jr. and Hattie Grindle (Bowden) Bisset, born in Scotland and at Penobscot, Maine, respectively. Her paternal grandparents were William and Margaret (Westland) Bisset. Her maternal grandparents were Bailey Walker Bowden and Mary Elizabeth (Harriman) Bowden, known as "Lizzie". On 13 December 1913 at Blue Hill, Maine, Mildred married Harvard Havey Clark, son of James Warren Clark and Ida (Lamson) Clark, both born at Franklin, Maine. Harvard was born at Franklin on 22 July 1895. The couple moved to Brewer, Maine, at some point, where they raised at least one child. I wish to thank you very much for our presents. I was awful pleased with my towel and so much work in it. You will get your presents sometime in the near future, I hope. If nothing happens we expect to come over and spend the day with you Sunday if the traveling is decent. I hope it will be by that time. If you have corrections to the information above, or if you have a theory as to the identity of the sender of the postcard, please leave a comment or contact me directly. I would be interested in purchasing this postcard to add to my Bowden genealogy.